A must-have for pain relief and injury treatment. Are you looking for a quality ice bag & wrap kit that can be used for first aid and pain relief? Do you want to do other things when using an ice bag for cold therapy? Yes, you find it. All resolved after owning this Koo-Care all-in-one leak-proof ice bag & wrap. ✓ With Koo-Care, you're taking on absolutely no risk. ✓ If you're not satisfied with your purchase for any reason, just tell us and we'll refund 100% of your purchase price - anytime! in the column of Customer Questions & Answers, and then download the document through the link in the answers. Hands-free design. 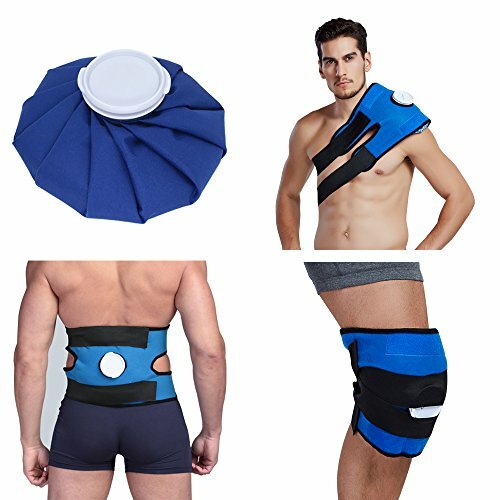 The wrap and the 2 elastic straps help you keep the ice bag in place easily, you can use it any place and do other things while applying heat or cold compress. Great! Multipurpose. Cold therapy be used for headache, fever, toothache, sprain, bruises, bumps and other sports injuries while heat therapy can be used for muscle pain & spasms, sprain, strain & stiffness etc. Quality and Safety. Thanks to the leak-proof lock, worry no longer about spilling water out, dripping and wet cloth. It's latex-free, CE and FDA certificated. Guarantee. With Koo-Care, you're taking on absolutely no risk. Our unconditional money-back guarantee is limitless. If you're not satisfied with your purchase for any reason, just tell us and we'll refund 100% of your purchase price - anytime! If you have any questions about this product by Koo-Care, contact us by completing and submitting the form below. If you are looking for a specif part number, please include it with your message.